Deduce and plot estimates of species richness through geological time. This month’s first Open Access article comes from Associate Editor Nick Golding and Bethan Purse. In their article, ‘Fast and flexible Bayesian species distribution modelling using Gaussian processes‘, the authors introduce Gaussian Process (GP) models and their application to species distribution modelling (SDM), illustrate how ecological knowledge can be incorporated into GP SDMs via Bayesian priors and formulate a simple GP SDM that can be fitted efficiently. Their model can be fitted either by learning the hyperparameters or by using a fixed approximation to them. Using a subset of the North American Breeding Bird Survey data set, they compare the out-of-sample predictive accuracy of these models with several commonly used SDM approaches for both presence/absence and presence-only data. A resource selection function is a model of the likelihood that an available spatial unit will be used by an animal, given its resource value. But how do we appropriately define availability? Our second Open Access article, ‘Integrated step selection analysis: bridging the gap between resource selection and animal movement‘ by Tal Avgar et al., addresses this question. It presents a simple extension to step selection analysis, which the authors call ‘integrated step selection analysis’ (iSSA). This approach relaxes the implicit assumption that observed movement attributes are independent of resource selection. Instead, it relies on simultaneously estimating movement and resource selection parameters, thus allowing simple likelihood-based inference of resource selection within a mechanistic movement model. Our March issue also features articles on Measuring and Modelling Abundance, Natural Selection, Species Interactions, Morphometrics, Chemical Ecology and more. Few birds are as characteristic of recently burned forests in western North America as the Black-backed Woodpecker (Picoides arcticus). Within months after flames have died out, these woodpeckers colonize charred montane conifer forests feeding primarily on wood-boring beetles (eg. Cerambycidae). The beetles are also new arrivals, benefitting from the vast expanses of standing dead trees called snags. Post-fire forest management largely focuses on the removal versus retention of snags, which can cause conflict where forest management goals fail to align with species conservation. Not all snags are created equal, however, and patches with more woodpeckers could be retained over less populous ones. If only the secretive, smoky-colored woodpeckers were not so hard to find. In the related article – An integrated occupancy and space-use model to predict abundance of imperfectly detected, territorial vertebrates – Tingley et al. develop a new predictive abundance model aimed toward imperfectly detected, territorial vertebrates. The Bayesian implementation of the model combines information on where species are likely to occur with their expected density, utilizing both occupancy-based surveys and home-range scaling models. 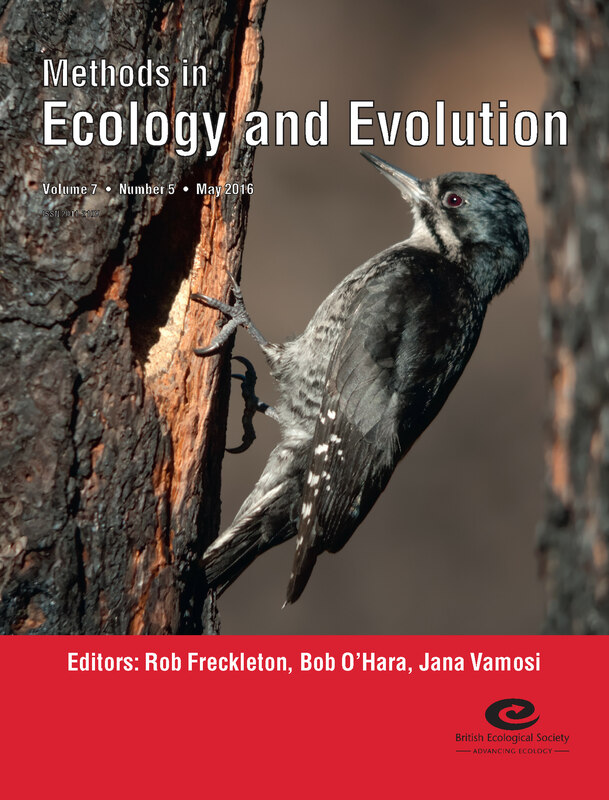 Using the case study of the Black-backed Woodpecker, the Tingley et al. model accurately predicts spatial patterns of abundance in 4 recent fires, highlighting the use of the model for both conservation and management. This entry was posted in Journal updates and tagged Abundance, animal movement, Bayesian Priors, Black-backed Woodpecker, Chemical Ecology, conservation, ecology, Gaussian Processes, Integrated Step Selection Analysis, macroevolution, methods, Morphometrics, Natural Selection, Occupancy Models, phylogenetics, piecewiseSEM, R, Resource Selection, species distribution model, Step Selection Analysis by Chris Grieves. Bookmark the permalink.